I notice that playback resume was possible by using the web interface in MPC with EMBY for WMC. Curious if something similar ever got extended to Emby Theatre. If so, how would I go about implementing it? It's not possible right now. It requires specific knowledge in the app of how mpchc works. Figured as much but I hadn't seen anyone mention since 2016 so I thought it was worth an ask. Any plans to include that in a future build, or is it more trouble than its worth? It would be nice feature to have as MPC-HC is the best player out there IMO however future development is unknown at this time. MPC-BE does appear to be actively developed though. Well I'm using MPC-BE as external player at the moment since the ET version of the MPV (test build) won't play 4K HDR media on my machine without dropping frames. Maybe that is just a bug though. If the final build is more efficient with its video processing, then I would probably stick with the internal player. If not, it would be great to have the option to more fully integrate with MPC (resume function etc.) as I also believe it to be the best player. I'm guessing all the devout MadVR disciples would agree with that too. I’m also forced to use mpc now. this all isn't demand enough? Edited by daedalus, 26 March 2018 - 05:17 PM. Yes I think it would be a nice thing to have. Is it also possible to make the external player a setting per user? I want to watch with the best quality possible and I’m willing to take some drawbacks for it (external player, no fancy ui while playing a movie, ...). But for the kids account I would like to keep things simple and use the internal player. I like this idea. In the event that something goes wrong with an external player when I'm around I can easily fix but if something goes wrong when I'm not around, which always seems to happen, I'm in big trouble. 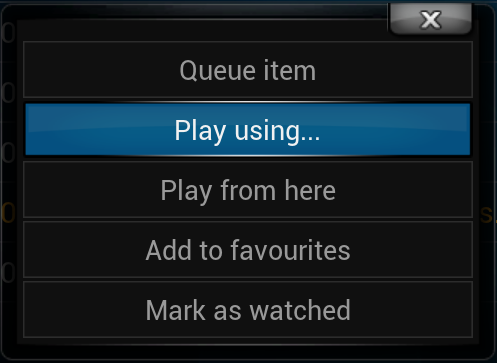 The way Kodi handles external players is to have a dropdown on the video info screen with "Play using" You can set the default player in your config which will work when you click the play button as your normally would but if you go to the "play using" drop down you can select from your list of external players. Edited by Jdiesel, 28 March 2018 - 11:35 AM.